The Central Motorway East Bypass is really quite unusual - more so than almost any other urban motorway. It's role was very simple - a bypass for the Central Motorway East and the Tyne Bridge, both of which were expected to reach their capacities relatively quickly. Whilst it was the first motorway to suffer from wavering support by the local authorities in the area, and indeed was practically cancelled whilst the Central Motorway East was under construction, provision was made both north and south of the river to complete the motorway later, with stub sliproads being constructed. Hmm, it should be quite easy to follow then. Indeed it is. We'll start at the southern end, in Gateshead. The Gateshead Highway is a reasonably high quality all-purpose route, but it comes to a crashing halt at the A184 junction with a very obvious unused section of the upper deck pointing northwards. This is the starting point of the CMEB. From here it would have crossed the river just east of the Tyne Bridge, and crossed the A186 at the junction between City Road and Melbourne Street. From there north it would have shadowed the Central Motorway East, finally ending at the junction with the Great North Road. You mentioned that there are stub sliproads built. Where are they? Whilst there does appear at first glance to be several other stub sliproads on the Central Motorway East, in reality they are simply to prevent bridge supports being placed in the middle of the roadway beneath. It's on the relevant Might Have Been Map page. So why was it cancelled before the rest of the system? 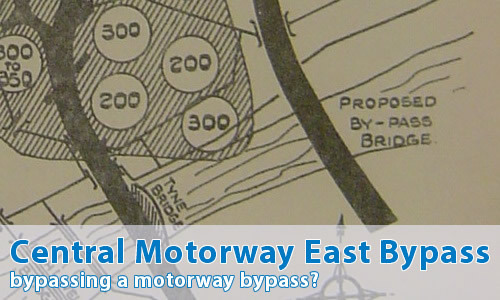 The Central Motorway East Bypass was always considered to be "in the future" - there are examples of documentation that suggest that "it is not expected to be needed for another 10 - 15 years". In addition, the later idea of a bridge downstream at Friars Goose seemed to offer better return, including easier access to Newcastle city centre from the south without having to travel through Gateshead.